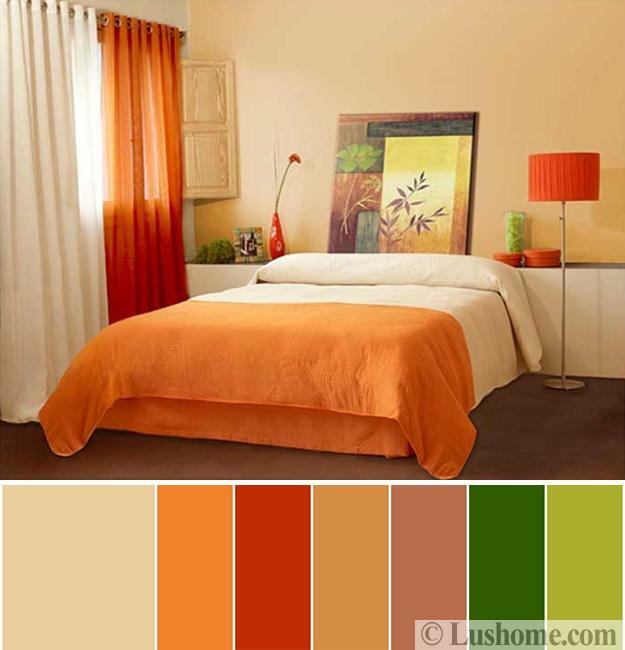 Orange color shades are very hot, perfect for stylish fall decorating. This color adds warmth and creates coziness in the rooms. 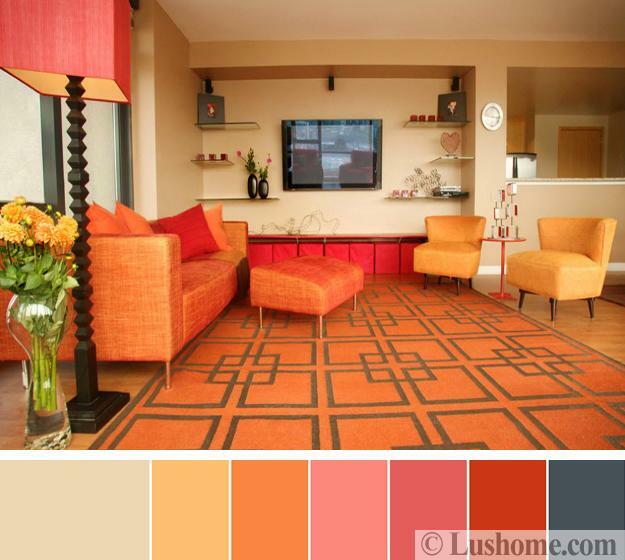 Orange brings optimism and dynamic energy into home interiors. 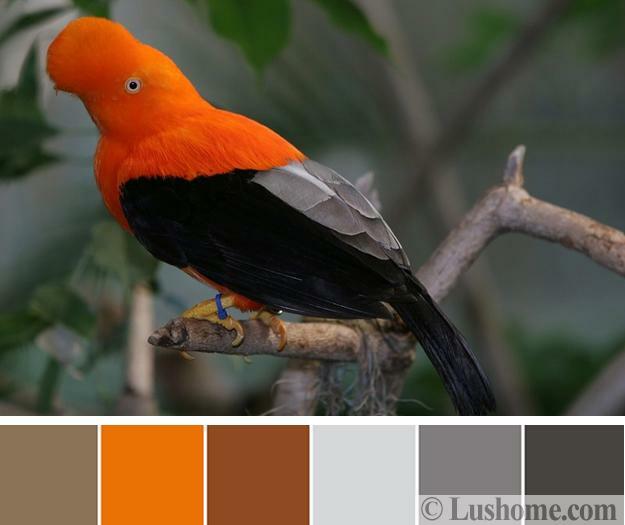 Vibrant color schemes with orange hues are fabulous choices for modern interior design. 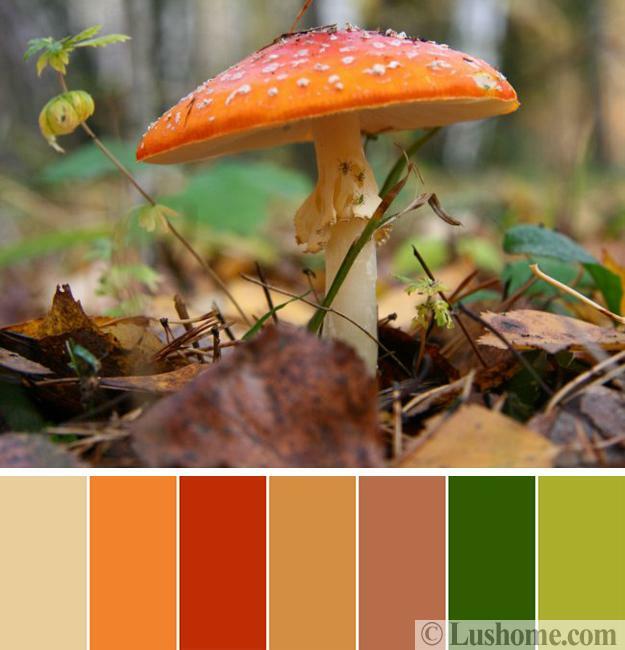 Have a look at beautiful color schemes for fall decorating inspired by nature. 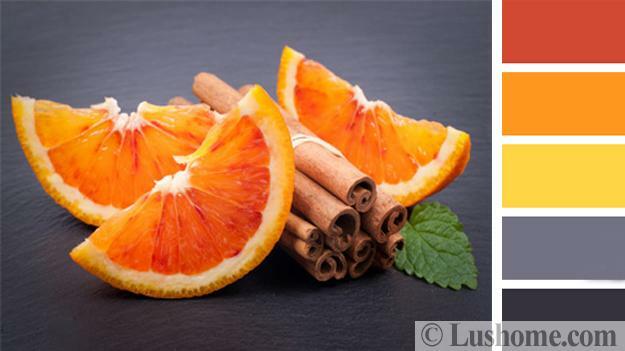 If you like orange accents, these color schemes show how beautiful, fresh, and modern the greens, browns, pinks, blue, and gray color tones look with warm hues. Rooms painted and decorated entirely in warm colors look dramatic, but muted greens, romantic pinks, yellowish brown color shades, peaceful blues, and elegant gray color tones add sophistication to modern interior design and refresh color combinations. The warm and cool color combinations make room decorating feel harmonious, natural, and relaxing. A touch of purple, dark red, burgundy or red wine colors are excellent also. 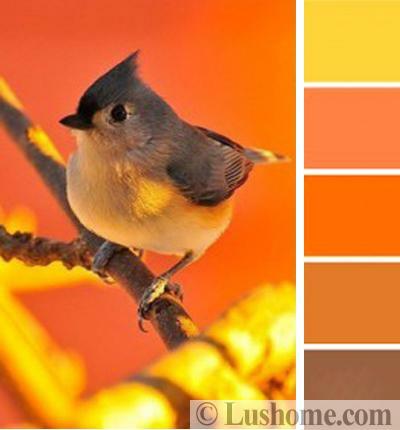 All gray color tones, pastel greens, yellowish-brown, bluish gray, and brown color shades work well with orange hues. Muted tones of greens, browns, and gray color tones, beautiful peach, sunny yellow, and deep reds are the ways to create fabulous color combinations. 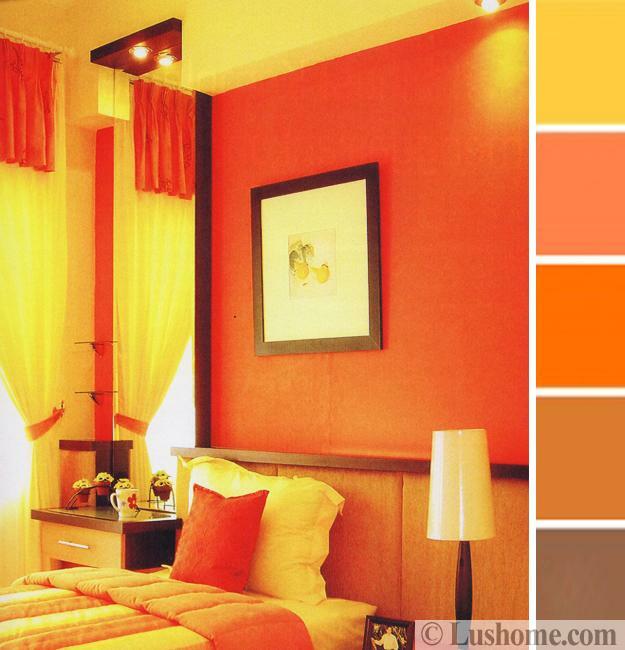 Here are stylish and balanced color schemes to use orange colors successfully in modern interior design. Mixing white and orange gets peach hues. Using yellow, orange, and peach creates a bright, warm interior design. Light, warm interior colors and white accents are ideal for small rooms, especially bedrooms and kids interiors. An accent wall in orange and peach, curtains, and bedding in light yellow are perfect for cozy small bedroom designs. Consider adding white as fabrics, lamp shades, vases or wall art to your room to bring a peaceful and tranquil feel into the interior design. 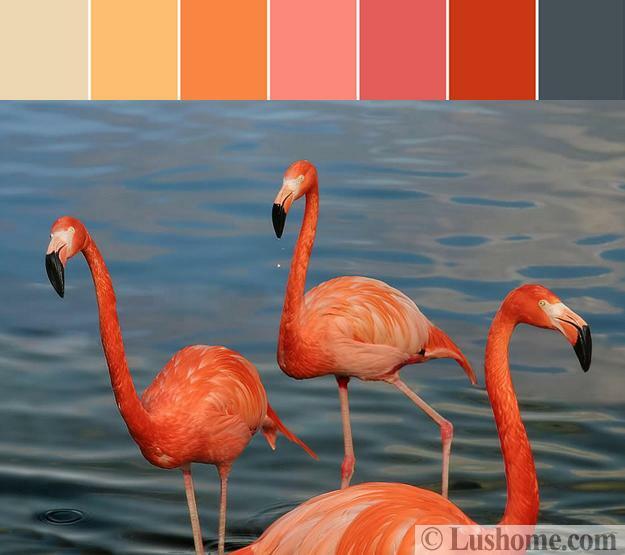 Color schemes with orange, peach, and gray colors are calm versions of bold orange palettes. They are perfect for creating elegance and a relaxing feel in your warm and bright rooms. 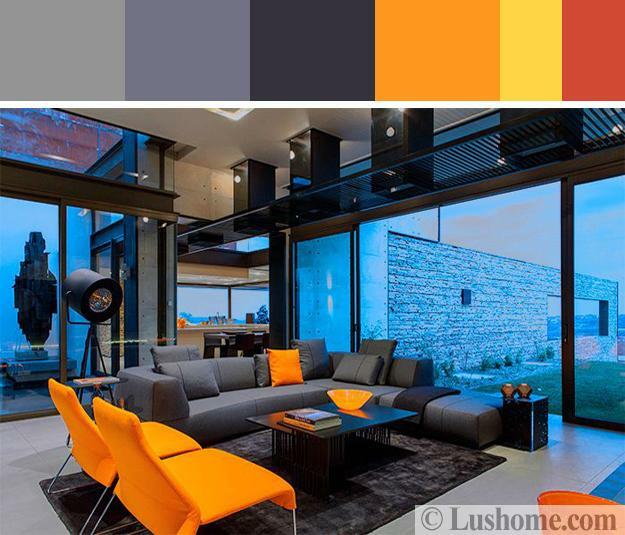 Another alternative is to use vibrant orange hues with dark gray color tones in your color scheme. Adding black to orange create a spectacular effect. From a bright orange shade to brown colors to a black-brown, dark gray color tones, the interior colors which add stunning contrasts make your interior design look impressive but comfortable. You may refer to wood colors and combine them with soft orange hues. Rich orange-brown color schemes feel cozy, elegant, and inviting. Consider painting your walls brown. Your couch in beautiful orange, glass coffee table, accent lamp in dark gray color, the furnishings create the beautiful living room. Add an area rug in gray and decorative pillows in a mix of soft peach, cream, orange and brown colors. Orange drapes and white doors will brighten up the stylish interior design while keeping the living room cozy and warm. Bright and pastel green hues, light blue color tones, and light, neutral colors emphasize the beauty of vibrant orange shades and amplify the coziness of dark orange color schemes. Vibrant blue is a fabulous compliment to orange, brown, and gray color tones. Peaceful blue is perfect for balancing and cooling down orange hues. 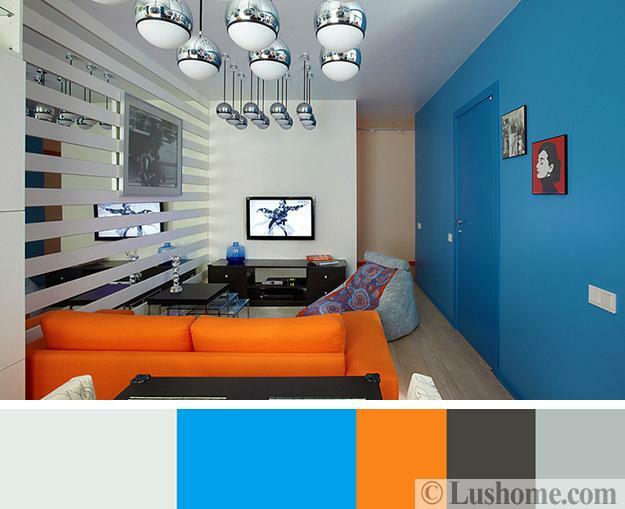 The complementing orange and blue color schemes look fresh and optimistic. When you add yellow to orange, you can use more gray colors and muted greens in your interior design. Grayish brown, bluish gray, greenish tones, blue pastels, and creamy shades work well with yellow, orange, and reddish-pink color shades. The citrus fruits inspired color palette mixes soft whites, light gray colors tones with warm yellow and pinkish orange. It feels energetic, elegant, and pleasant, allowing to work with neutral colors, light beiges, tans, and black.